The Xerox C20 Copier is truly an incredible unit. The Xerox C20 delivers copies at a fast 22 copies per minute! Also, full duplex is standard in both copy and print modes. This is a feature you just don't find in today's technology. 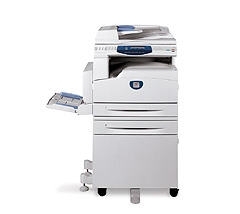 Also, the Xerox C20 copier comes standard with a 50 Sheet Duplex Automatic Document Handler allows you to copy, scan large jobs and 2-sided documents. Want more versatility? How about sorting standard! Sort all your documents and arrange them in packets for easy storage! Want more? The Xerox C20 Copier also has functionality like adding an extra 500 sheet tray! Create Booklet reduces the size of each page by 50% and prints two pages per side. The pages are printed in the correct order so the document can be folded and stapled to form a booklet. N-Up Copying enables printing of more than one page on a single sheet. One-up, two-up, or four-up printing on the same page. This environmentally friendly feature decreases the consumption of paper and toner. Covers allow you to feed the front and back pages of the document from a different media tray. AutoFit automatically scales a page to best fit the sheet size of the media in the designated input tray. Auto 2-sided printing allows you to print on both sides of the paper without reloading sheets. Clone allows you to print multiple images on a single sheet of paper. The number of images produced is determined automatically based on the original image size. Edge erase can be used to 'clean up' the edges of an original e.g. if it is frayed or has hole punch or staple marks. Transparency interleave allows you to insert either blank or printed dividers. (c) 2006-2009 CAPRISAG TRADING. All rights reserved.